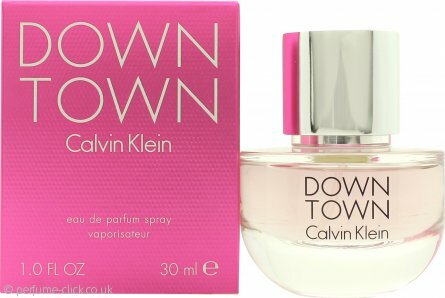 Downtown by Calvin Klein is a floral and woody fragrance for women. This is a sweet and fun scent aimed at outgoing women. Downtown works just as well during the day as on a night out and contains notes of Italian lemon, bergamot, Tunisian neroli, green pear, aquatic plum, gardenia petals, pink pepper, violet leaves, cedar from Texas, incense, vetiver and velvety musk. Downtown was launched in 2013. Calvin Klein Downtown Eau de Parfum 90ml SprayGreat price, Great perfume! Ordered as a Christmas gift. Fantastic size bottle for a great price. Prompt delivery too. Just what I needed. A truly exceptional fragrance from a powerhouse like Calvin Klein. Downtown contains notes of Italian cedar, bergamot and Tunisian neroli along nuances of fresh green pear and dewy watery plum. It also contains Gardenia petals and Texan cedar wood, Lao benzoin, and warm musk. Calvin Klein Downtown Eau de Parfum 90ml SprayLovely perfume, great service! Had a tester of this one ages ago and been meaning to buy it, was shopping for my Grandad's birthday and saw this on offer so treated myself, glad I did, lot of praise for my new scent! Excellent service as always from Perfume Click, will return. I love this purfume and its was a good price. It smells lovely and I like wearing it every day. Everyone comments on it, when I wear it. Calvin Klein Downtown Eau de Parfum 90ml SprayLovely perfume, not too strong. Purchased this for my mum, as she doesn't like anything too strong. So this was perfect for her. Would definitely recommend for anyone that wants something soft but nice at the same time. The price was also good for the size of the bottle. Bought this for my wife and pleasantly surprised at speed of delivery and price. Wife loves the perfume. Will definitely purchase again. Calvin Klein Downtown Eau de Parfum 90ml Spraylove this stuff ! This is the third bottle I have bought for my partner.She absolutely loves it & I love it on her. I'll be coming back for more.